Zoya’s Adina was part of the Reverie collection, released for Spring/Summer 2010. It’s a pretty awesome collection as it happens; I only own one other from it, Reece, I’ll definitely be showing you that soon too. Massive thanks for this go to Kitty for including this in our swap! Sorry about the faint sheet-marks in the above photo (bad blogger didn’t wait long enough after painting before going to bed), and also the nasty peeling that is evident on my index and middle fingers. These pictures are a couple of weeks old, the peeling is getting better now thankfully. BUT ANYWAY. Just frigging look at the polish. Purple. Green. Duochrome. Opaque, nearly a one coater. GUUHHH. Awesome. The only slight little niggle I have with Zoya is the brush – it’s so tiny and stumpy. But that’s a small price to pay for such great polishes. As with any post that has ‘Polishgasm’ in the title, I don’t need to say a lot. The pictures speak for themselves. BuyaPowa.com – We’re In This Together! 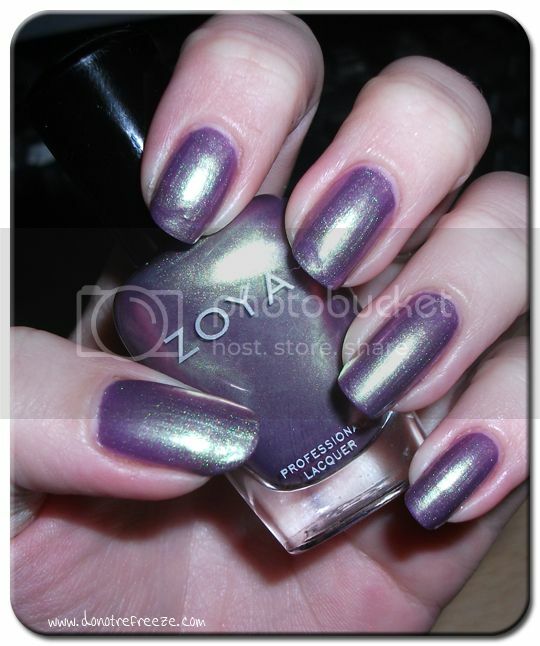 I just love this color!! Oooft, this is a beaut’ and a half!